In a skillet, melt the butter and add peach slices. Sprinkle with brown sugar and saute until the peaches are soft and caramelized. Remove the peaches from the pan and wipe clean. Add a bit more butter to the pan and place the tortilla in it. Sprinkle with gouda. 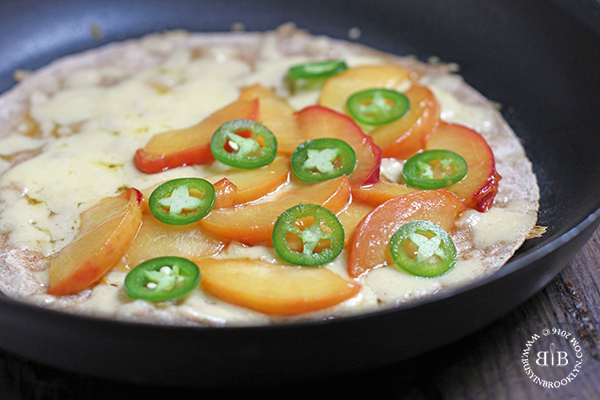 When the cheese begins to melt, add the peach slices, jalapeno and arugula to half of the quesadilla and fold closed. Cut the quesadilla into quarters and serve immediately. NO-CARB VARIATION: Make a salad with arugula, sliced peaches (caramelizing optional), chunks of gouda and thinly sliced jalapeno. Make a dressing with olive oil, balsamic vinegar, honey, salt and pepper and drizzle over the salad.